What makes our Teeth-in-1-Day" procedure different? The most common way this procedure is done at other Dental Practices. On 1 of several initial visits impressions are taken for a surgical guide and a temporary denture. On a subsequent visit the procedure is performed, this may be done by another Dentist that you are referred to. 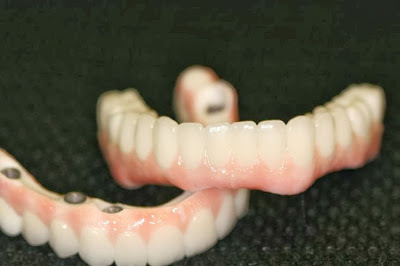 After your surgery the denture they made before-hand is modified to fit the implants. In approximately 6 months you return for permanent teeth that they will send to a lab to have a titanium bar manufactured. A. Dr. Golpa expertly performs every aspect of your surgery. B. Your surgery will be performed 1 day after your initial visit. C. Your teeth will be custom manufactured in our laboratory using state-of-the-art milling machines, and designed by industry leading experts IN-HOUSE (NOT A MODIFIED DENTURE). 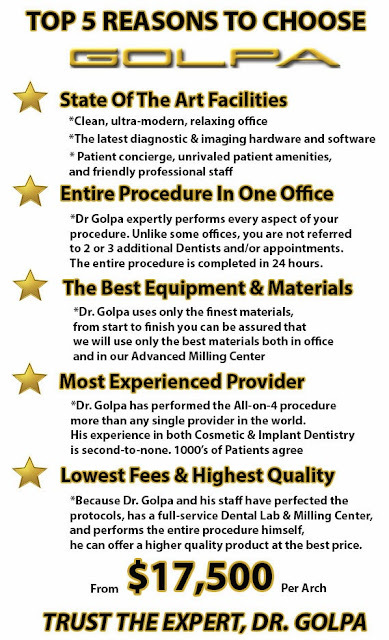 — at Golpa Dental Implant Center - Las Vegas.